Up until that point, we were doing our best to be healthy meat-eaters so our staples were usually ground turkey, ground chicken, and chicken breasts. We knew how to cook with those meats. We knew what paired well with them. How were we possibly going to figure out how to make vegetables and fish interesting? What were we going to put on our pescetarian grocery list? We grabbed a bunch of frozen fish in a box and hoped for the best. 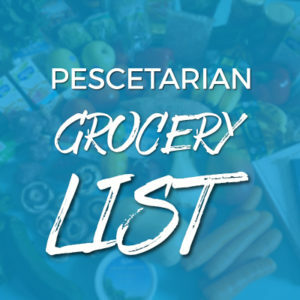 Free Download: Take Our Printable Pescetarian ﻿﻿Grocery List To Go! Now if you’ve ever had frozen fish out of a box, you know that’s not going to end well. Yep, that was pretty much how our first trip to the grocery store went. Fast forward to today and we’ve learned a LOT more, we’ve tried a lot more food combinations, and figured out what our taste buds like and also what’s healthiest for us. So my friends, to save you from the boxes of fish sticks, here is our master list of foods we keep in stock and fill up on come grocery day. It’s mostly the fresh produce we stock up on every few days as the other stuff usually lasts quite a while. As always, try to buy organic whenever you can. Avocados: This healthy fat we have at least once per day, usually with lunch. We’ve found the California avocados to be our favorite. Tomatoes: Easy to chop up and add raw to a salad, though cooking them a bit helps release their healthy benefits. Sweet Potatoes: Fill it, bake it, boil it, you can’t go wrong with sweet potatoes. Mixed Greens: Probably the one thing we go through the quickest, we have at least 2 cups each with lunch and dinner. Spinach: An alternative to mixed greens, but also yummy sautéed in coconut oil with fried eggs for breakfast. Broccoli: Stir fry here we come. Carrots: Snack it, stir fry it, roast it. You can’t go wrong. Garlic: Can’t be without this little magic ingredient. It pops up in almost every meal! Onions: Garlics perfect companion, don’t forget these. Red pepper: Roasted, sautéed, grilled – so many ways to cook red pepper and release it’s sweet flavor. Zucchini: This summer fresh veggie is great raw or cooked. Mushrooms: You can’t have an omelet without it can you? Green Onions: We love asian flavors and these are a must-have for any stir fry, dipping sauce, or patty. Kale: Add to a smoothie raw, or bake in the oven for a quick snack. Swiss Chard: Another green that’s great for sautéing or adding to smoothies. Lemons: Great for a detoxing drink, but also a staple for livening up your fish fillets. Ginger: We buy a nice big chunk of garlic, pop it in the freezer, and grate it from frozen when needed – try this it works great! 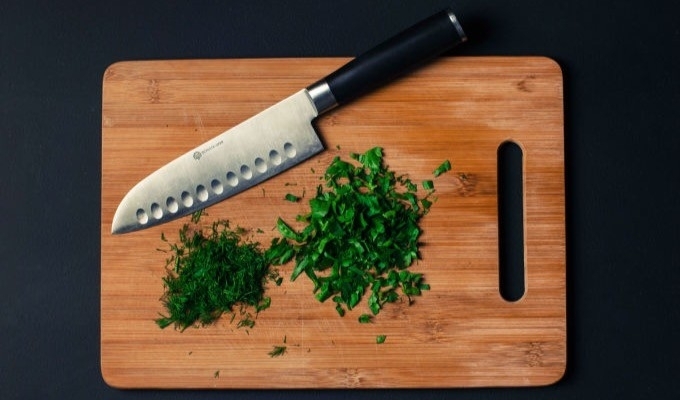 Parsley: Perfect pairing with fish, vegetables, or even for adding to smoothies. Cilantro: Some people hate it, some people (like us) love it. 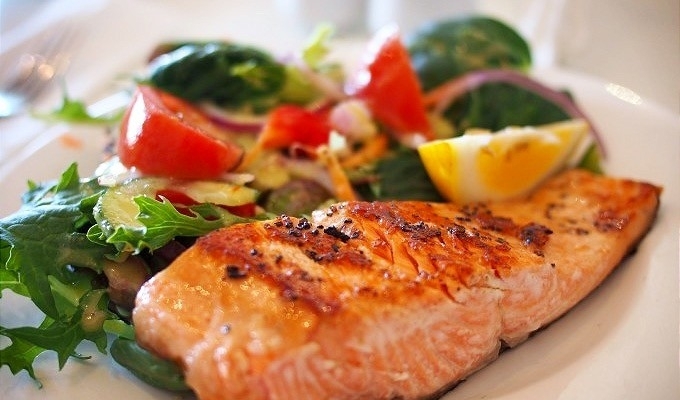 Salmon fillets: Our favorite fish, we buy it wild caught from the Pacific. Beware of Atlantic with a “wild caught” sticker – it’s illegal to fish in the wild waters in that region. Tilapia fillets: So many ways you can go with flavors, or stick to the classics: garlic and lemon. Haddock fillets: Go-to when we’re in the mood for some old fashioned fish ‘n chips. Salmon in a can: So versatile, usually we use it in bite-sized patties, or for making salmon burgers. Great for adding to a quick healthy lunch or dinner. Tuna in a can: We try not to eat this more than once per week, but when we do usually a tuna salad sandwich comes into play. Sardines in a tin: One of the healthiest choices you can make as a pescetarian, we have these little guys a few times per week. They come flavored in the tin, or you can flavor them yourself. 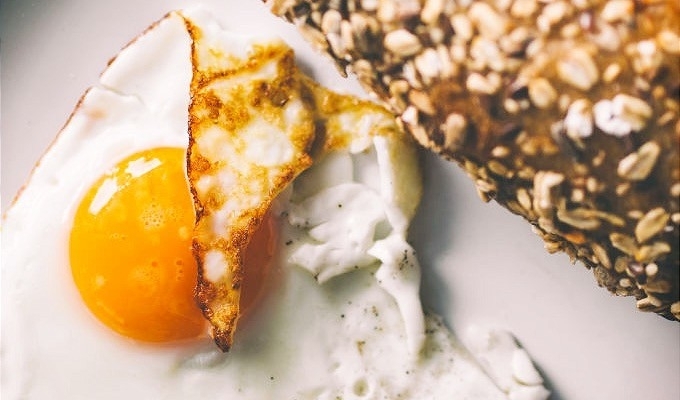 Eggs: Eggs are one of our favorite complete proteins, they contain all the essential amino acids and are very versatile. Oatmeal: This is a typical breakfast of ours, because it’s so full of fibre, it’s keeps us full for a long time. 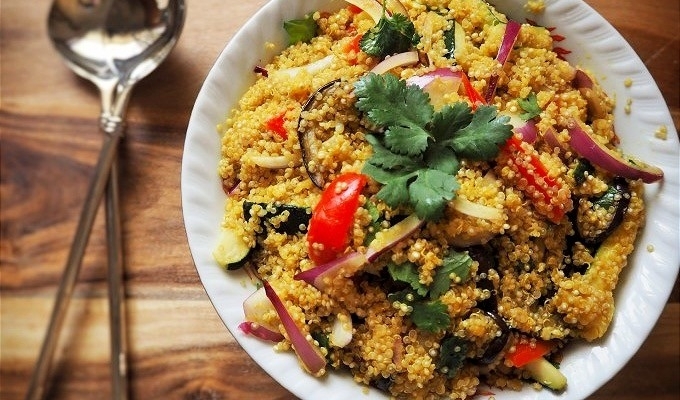 Quinoa: One of natures perfect plant-proteins and sources of plant-based iron for vegetarians and pescetarians. So many ways to flavor, so little time. Quinoa or rice pasta: Instead of going for wheat pasta, we reach for one of these equally delicious and filling. 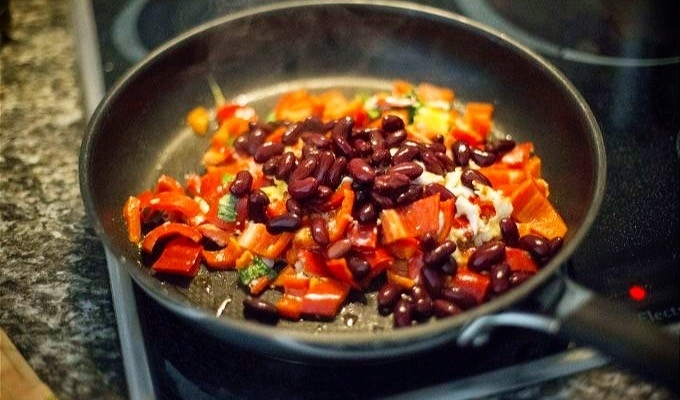 Black beans: Such a great source of protein and fibre, black beans are another one of our daily additions whether to salads, or black bean burgers. Chickpeas: Just like black beans, we add this to everything. You may be surprised to know chickpeas are also excellent in desserts! Lentils: One of the best plant-based sources of iron, these are great in curries, wraps, or to add some “meat” to any veggie dish. Almonds: Just like avocado, almonds are full of healthy fats and make the perfect filling snack between meals. Brazil Nuts: Even just one of these a day is enough for boosting your mood. Natural vitamins FTW! Chia Seeds: Energy boosting, high in Omega 3’s and oh-so versatile. Flax Seeds: We usually ground these up in the blender and sprinkle a tablespoon over our foods. Almond milk: We’re slowly moving to making our own batches, but for now, you can get close to pure almond milk in the grocery store as long as you look at the labels. 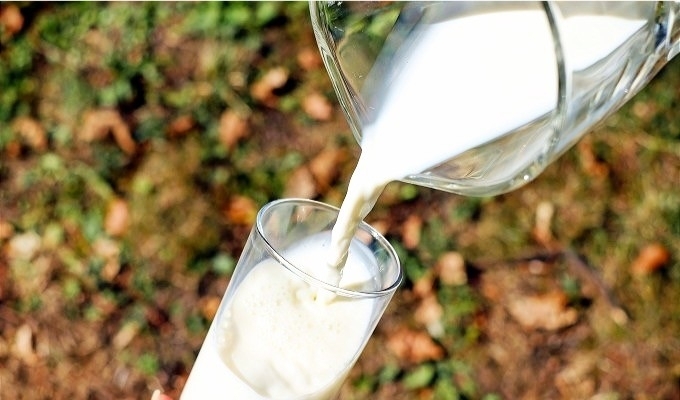 Cashew milk: An creamy alternative to almond milk, and higher in fat. But great for cereal or a smoothie. Goats cheese: Protein packed and a good dairy substitute since it’s much easier to digest not to mention it packs a flavor punch. Goats milk yoghurt: Tastes just like the real thing, but without all those hormone disruptors found in cows milk. 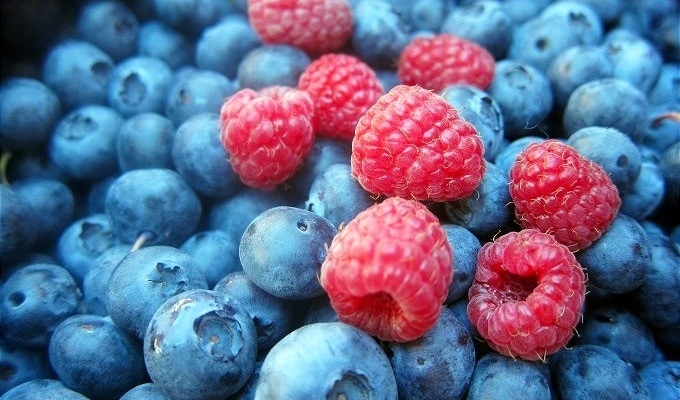 Mixed berries: These include blueberries, raspberries, blackberries or strawberries. We toss a few of them on our oatmeal in the morning for a pop of sweetness and freshness. Oranges: Gotta get that Vitamin C, and they’re a good in between snack food. Apples: Chop them in slices and slather some nut butter and you’re good to go. Bananas: One a day keeps the…muscles relaxed, helps you sleep, lowers your blood pressure…should we go on? Almond flour: Great wheat-free flour substitute! We’ve gotta have our gluten-free desserts. Tapioca flour: Goes hands in hand with almond flour and is great for getting the same chewy-ness of regular pizza dough. Vegetable broth: Must have when making stews or curries. Make sure to check the sodium content, some of them are pretty high up there. Nutritional Yeast: We use this to season popcorn, eggs, or anything else when we’re after a cheesy flavor. Crushed tomatoes: Always have a can or two of these in the cupboard to add to stews or curries. Coconut Milk: We use this for anything from making dairy-free ice cream to a Thai curry. Rice Vinegar: Must have for salad dressings, and for adding to a fish sauce. Extra Virgin Olive Oil: You can’t make a homemade salad dressing without it, and it’s pretty good for cooking too. Coconut Oil: We use this in everything! It aids in digestion and not to mention tastes good too. Sesame Oil: Must have for Thai inspired flavors, and works so well with fish. 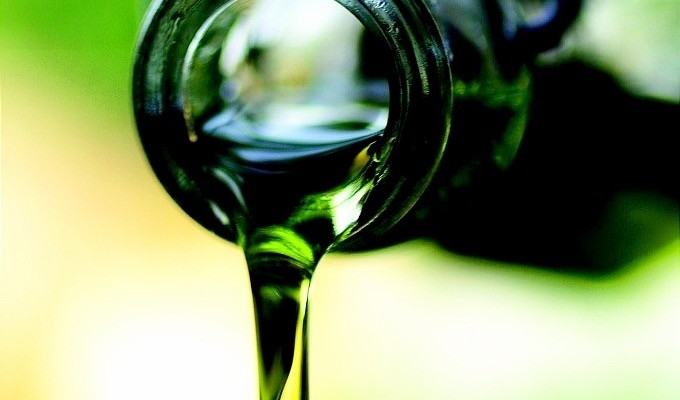 Avocado Oil: With it’s high smoking point, we usually use this oil when we want to be a bit naughty and fry something up. Maple Syrup: Never-ending uses for good ‘ol Canadian maple syrup (the BEST). Cacao: Need to bake up something chocolatey? You need cacao. 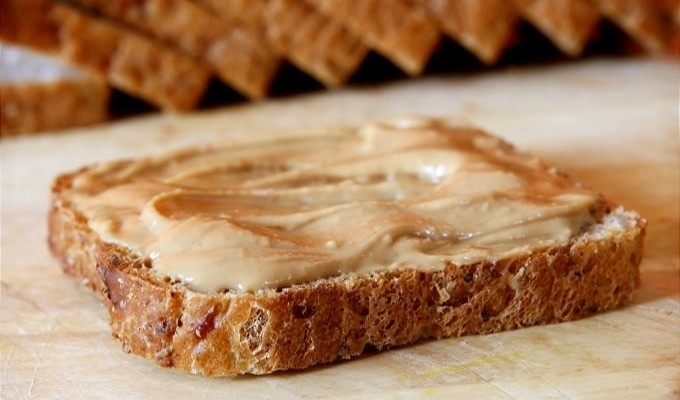 Nut Butters: Because sometimes the cravings for PB&J are too strong. Our favorites are almond butter, peanut butter and cashew butter. Mustard: Mix with some honey for a quick honey mustard sauce. Apple Cider Vinegar: We use this for making salad dressings or sauces. But more importantly, for making super easy detox drinks. Kimchi: Full of probiotics, add a tablespoon or two to each meal and you’re set. Mayonnaise: Because you can’t make tuna salad without it. Turmeric: You know that hot sauce ad “I put that sh!t on everything!” ? Yep, that’s how we feel about this anti-inflammatory spice. Basil: Gotta have this for yummy pestos, and tomato basil sauces. Curry Spice: You could make your own blend, but when you’re in a rush to make a curry, this is the perfect companion. Oregano: Goes great with fish and Italian flavors. Paprika: The key to a good blackened tilapia. Rosemary: When you’re roasting veggies, you can’t not use rosemary. Cumin: Flavors so many veggies and fish so well. Cinnamon: Just like turmeric, there’s so many meals you can add cinnamon to – especially oatmeal in the morning. 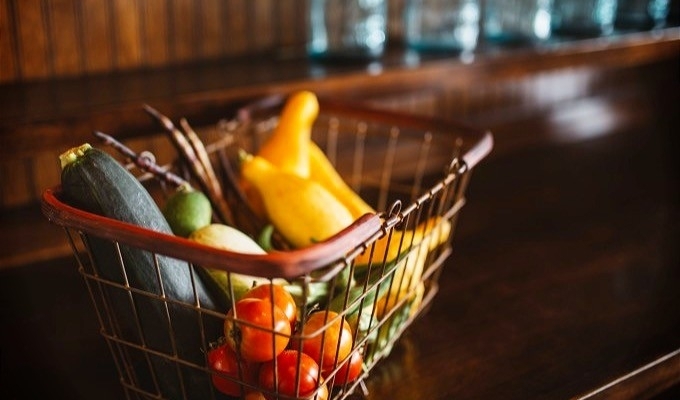 Where should we send your printable grocery list?